America's Child is a groundbreaking, genre-bending work of beauty. Shemekia is one of the great singers of our time. This record introduces listeners to another side of her, and I predict it will result in many new fans. Her voice on these songs is nothing short of magic. Shemekia Copeland is the real deal. America's Child goes deep and Shemekia‘s voice -- a national treasure -- carries the songs effortlessly, whether topical, personal, spiritual, political or just plain raucous fun. Shemekia rears back her head and what comes out is humanity made vocal. Award-winning vocalist Shemekia Copeland will release her potent new Alligator Records album, America's Child, on Friday, August 3, 2018. Produced by Americana Instrumentalist Of The Year winner Will Kimbrough (who also plays guitar on the album) and recorded in Nashville, America's Child is a courageous and fiery statement of purpose, a major step forward for the singer whose musical consciousness continues to expand as her star continues to rise. America's Child is by far Copeland's most compelling work yet, with music swelling beyond blues and into spirited Americana, with elements of rock, soul, and country. Her instantly recognizable voice—capable of being sultry, assertive and roaring—delivers every song with unparalleled honesty and passion. The three-time Grammy nominee’s wide-open vision of contemporary Americana roots and soul music showcases the evolution of a passionate artist with an up-to-the-minute musical and lyrical approach. From America's Child's anthemic opening track, Ain’t Got Time For Hate, to the closing lullaby, the traditional Go To Sleepy Little Baby, Shemekia sings with passion and insight about the chaos and uncertainty in the world while still finding joy all around her. With guests including John Prine, Rhiannon Giddens, Mary Gauthier, Emmylou Harris, Steve Cropper, J.D. Wilkes, Al Perkins and members of the Time Jumpers, America’s Child bursts with Copeland’s bravado and embraces with her tenderness. Gauthier and songwriter/executive producer John Hahn wrote two striking songs for the project. Smoked Ham And Peaches is a search for truth and tranquility in America, featuring Giddens on African banjo. Americans celebrates our collective diversity in all its forms and colors. American music legend Prine joins Shemekia for a stirring duet on his own Great Rain. Guitar great Cropper adds his scorching playing to the ballad Promised Myself, written by Shemekia's father, the late bluesman Johnny Clyde Copeland. And her version of I'm Not Like Everybody Else transforms the Kinks song into a blues-fueled declaration of independence. 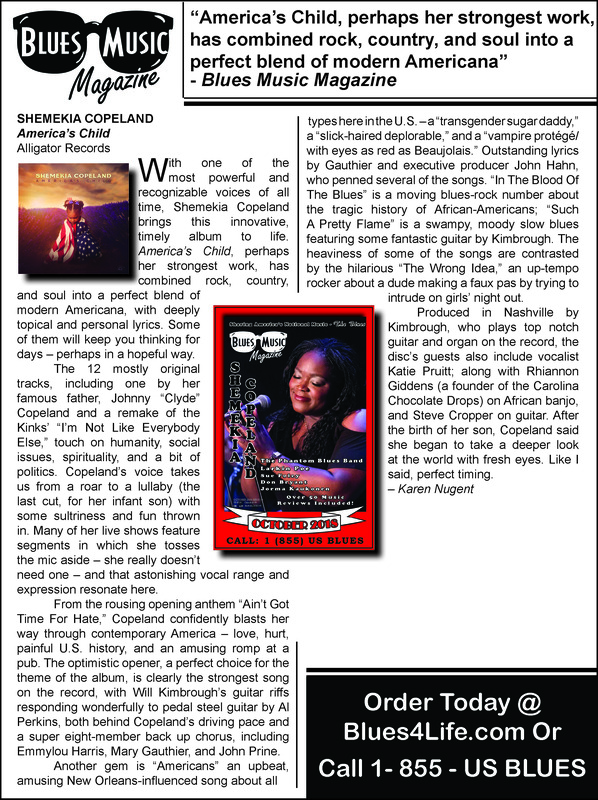 When Shemekia broke on the scene at age 18 in 1998 with her groundbreaking Alligator Records debut CD, Turn The Heat Up, she instantly became a blues and R&B force to be reckoned with. News outlets from The New York Times to CNN praised Copeland's talent, larger-than-life personality, and true star power. With each subsequent release, Copeland's music has continued to grow. From her debut through 2005's The Soul Truth, Shemekia earned eight Blues Music Awards, a host of Living Blues Awards (including the prestigious 2010 Blues Artist Of The Year) and more accolades from fans, critics and fellow musicians. 2000’s Wicked received a Grammy nomination. Two highly successful releases on Telarc (including 2012's Grammy-nominated 33 1/3) cemented her reputation as a singer who, according to NPR's All Things Considered, "embodies the blues with her powerful vocal chops and fearless look at social issues." Copeland returned to Alligator Records in 2015 with the Grammy-nominated Outskirts Of Love. She won the 2017 Living Blues Readers’ Award for Blues Artist Of The Year (Female), the same distinction she won the year before. She also took home the 2016 Blues Music Award (BMA) for Contemporary Blues Female Artist Of The Year. Outskirts Of Love won the BMA for Best Blues Album Of The Year. MOJO said Copeland was "spectacular, stirring, sanctified and sassy." Shemekia Copeland has performed thousands of gigs at clubs, festivals and concert halls all over the world and has appeared on national television, NPR, and in newspapers, films and magazines. She's sung with Eric Clapton, Bonnie Raitt, Keith Richards, Carlos Santana, James Cotton and many others. She opened for The Rolling Stones and entertained U.S. troops in Iraq and Kuwait. Jeff Beck calls her “amazing.” Santana says, “She’s incandescent…a diamond.” In 2012, she performed with B.B. King, Mick Jagger, Buddy Guy, Trombone Shorty, Gary Clark, Jr. and others at the White House for President and Mrs. Obama. Now, with America's Child, Shemekia Copeland is standing on the cusp of her greatest success. Her intensely empowering, American music is as insightful as it is fun. Upon release of the album, she'll tour nationwide, including a showcase performance at the Americana Music Festival in Nashville in September. NPR Music says, "She brings a perfect balance of authority and understatement to each song." No Depressionadds, "When Shemekia Copeland opens her mouth, everybody pays attention. She pierces your soul. This is how you do it, and nobody does it better than Shemekia Copeland."